From the table of contents: Geometric Magnitudes; Loci and their Equations; The Straight Line; The Circle; Transformation of Coordinates; The Parabola; The Ellipse; The Hyperbola; Conics in General; Polar Coordinates; Higher Plane Curves; Point, Plane, and Line; Surfaces. This textbook is designed for Colleges, Universities, and Technical Schools. The aim of the author has been to prepare a work for beginners, and at the same time to make it sufficiently comprehensive for the requirements of an undergraduate course. 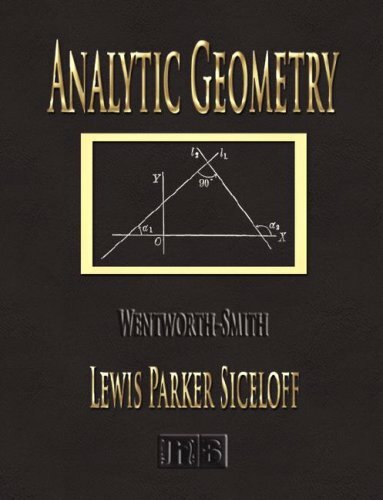 The principles of Analytical Geometry are developed in the first two chapters of this book. The remainder of the book is occupied in applying the principles and methods of Analytical Geometry to the straight line, circle, parabola, etc. This is a regular textbook of analytical geometry covering vector algebra and its applications to describing straight lines, planes, and quadrics in two and three dimensions. The book is addressed to students of mathematics, physics and engineering.